You wouldn't know it to look around today, but the Canada Goose was once an uncommon bird. In particular, the subspecies known as the giant Canada Goose was considered extinct until a few remnant populations were discovered in the early 1960's. Over-hunting and destruction of wetlands had driven them to the brink. Improved game management practices and extensive re-introduction programs were begun to stabilize the subspecies and today it is doing fine. Originally a North American bird, the Canada Goose has also been transplanted successfully to Britain and Scandinavia. A 1991 census recorded 63,581 in the United Kingdom. A protective mother with her new brood. Depending on who you talk to, there are up to eleven subspecies of Canada Goose. The largest is the giant, with a wingspan of 6 feet and weighing up to 20 pounds. Among North American waterfowl, only the swans are larger. The smallest version is the so-called "cackling" goose, which weighs only 2-4 pounds. (This is now considered a separate species.) The giant Canada Goose is native to the Great Plains. It is unique in being non-migratory, at least in comparison to the other subspecies. The other subspecies nest from southern Canada up to the high Arctic tundra, and travel long distances in their annual migration. If the winter is mild, the giant may not leave its nesting area at all. When they do travel, Canada Geese stay in family groups. The parents fly with the young of the year. If you watch a large flock of geese come in for a landing, you can often see the different family units peel off in smaller clusters before they alight. The family bond begins at the nest. Canada Geese mate for life. In Kansas, they begin to build their nest as early as mid-March. The nest is a large mound of vegetation such as grass and cattail stems lined with down. It is usually located within sight of water. Canada Geese will also use nesting platforms provided by people. If you have a pond and want to make one of these, you can download plans here. 4 to 7 eggs make up a typical clutch and incubation is done solely by the female. The male (gander) zealously guards the nest and will attack any intruders. 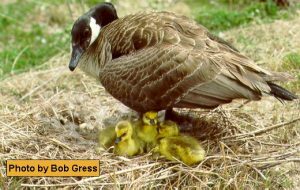 Incubation takes 25 to 30 days and the goslings are led to water within a day after hatching. After hatching, there is an amazing change in the attitude of the gander. Where he would previously chase off any other geese in the area, he now becomes much more tolerant of them. Indeed, if there are other clutches of goslings in the area, they will often group together in flocks called "crèches" and be looked after by all the adults. Canada Geese are very vocal creatures and their language is not hard to pick up if you pay close attention. Aside from vocalizations, geese have a whole vocabulary of "body language" that is very interesting to observe also. -The gander has a slower, low-pitched "ahonk" while the goose's voice is a much quicker and higher-pitched "hink". Mated pairs will greet each other by alternating their calls so rapidly that it seems like only one is talking. A careful ear will be able to put each voice with its rightful owner, which is mighty helpful since the male and female look alike. -The goslings have a wheezy soft call that may be either in distinct parts - "wheep-wheep-wheep" - or a drawn out whinny - "wheee-oow". Anyone who has raised domestic geese will immediately recognize these calls. Just as in adolescent boys, when the voice changes as the goose matures it will often "crack" and sound like a cross between a honk and a wheeze. This will be noticeable when the goslings are becoming fully feathered and starting to show the distinct black and white adult coloration. -Loud, rapid calls will be made when geese are feeling threatened or excited. During territorial disputes or aggressive displays, some "bad grammar" will often be heard. When a flock gets ready to take off and fly away, they will usually all join in a raucous chorus. And a whole flock of geese makes quite a racket! In Wichita as well as other cities across the lower 48 states, the phenomenon of the Urban Goose has become quite noticeable in the last two decades. The giant subspecies in particular has developed a great tolerance - preference even - for wintering in cities. Not only that, but some of them have taken up year-round residence in those cities! Wichita's flock has been carefully studied. Every winter in late January a census is taken of the urban wintering geese. Between 1983 and 2007 the size of the urban wintering goose flock in Wichita grew from 1,600 to over 21,000 birds! A summer survey to track the resident population has been conducted since 2002 and those numbers have grown too, with nearly 1,700 birds in the 2006 survey. Why are cities becoming wintering destinations for the Canada Goose? -More than other goose species, the Canada Goose has a high tolerance for people. -The habitat is right. Golf courses and the typical suburban housing development that includes a pond of some sort are ideal for the birds. For sleeping at night and loafing during the day, they prefer the combination of water and grassy areas with open sightlines between the two. In cities they are protected from predators. Loose dogs are about their only concern. -People bring them food. Feeding the geese is an activity that many people find enjoyable. (Of course, the geese enjoy this too!) The green lawns in the areas described above are consumed with gusto by the geese also. -The geese find other food in abundance within a short flight from town. Waste grain and new green wheat in farm fields nearby are consumed with relish by the birds on their daily foraging trips. -And the social nature of the birds can be greatly credited for this phenomenon. When one family of geese discovers that the city life is a good deal, they will remember and return the following year along with their youngsters and any flockmates they travel with. With its interesting social behavior and high tolerance for people (not to mention its natty tuxedo!) the Canada Goose is an appealing member of the Great Plains fauna. During spring and fall, take the time to get out and listen for "Goose Music", the faint honking spilling down from the skies from distant vees of migrating geese. Late afternoon on a still day is a good time. It is a hallmark of the annual cycle of life on the prairie. You may have to get clear out of town to hear it, but it will be worth it.